One night, four restaurants and five wines! The launch of Restaurant Week kicked off its savoury season with a bang with some bubbly from Select Brands. A fortunate batch of food bloggers from delicious walks of the island were privileged to cruise through Kingston the Private Selection Blogger Bus, powered by Select Brands. The ‘meat’ of the matter took place as they all gathered at the Terra Nova Hotel in the city. Sipping on Sauvignon Blanc from the Robert Mondavi Private Selection with winemaker Jason Dodge, it was a great opportunity to get to know specially invited guests before embarking on the most wine-tastic night ever! The first salacious stop was East Japanese. Served a variety of rolls, they were hooked on the Negi Hama Roll, a match made in heaven for the Sauvignon Blanc Private Selection wine! This was arguably the best pairing for the night. Fromage Brasserie graced their palates for stop number two. Indulging in white pizza as well as shrimp and pepperoni. Name a better combination than white pizza and Chardonnay? We’ll wait! The dining experience was nothing short of divine. Added bonus: they were well taken care of by the Fromage staff. The real shining star of the evening was the Private Selection Chardonnay: a dry crisp white wine that will have you asking for another glass in no time. Delectable door number three opened up to Steakhouse On The Verandah at Devon House. Greeted by the chef for the evening, Chef Alex ‘De Great’, who wished them happy dining, they were presented with fillet mignon with hollandaise sauce. Each bite bursting with unique taste, the juices from the succulent steak danced merrily on our taste buds. The steak was paired with Private Selection Pinot Noir, bringing out all the hidden flavours eager to dish out! The gastronomic excursion returned to the Terra Nova Hotel for dessert. Sweetly served chocolate mousse and rum bread pudding were paired with the Heritage Red Blend – the closing wine of the night. The rum bread pudding provided an excellent balance of rum and sweetness. 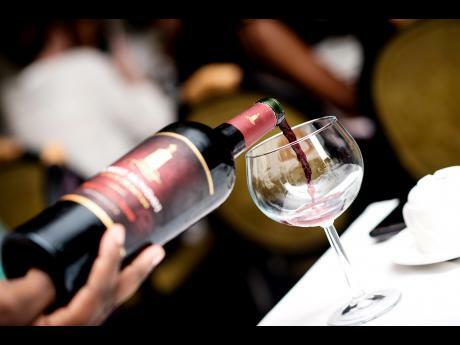 While they could not help but love the Heritage Red Blend, which boasted a bold, rich flavour – a blend with character! It was a great night filled with laughter, good food, great wines and new friends! Cheers to the greatest pairing of them all: lovely hosts Restaurant Week and Select Brands.